With a recent BBC news report finding that 16 million people in the UK have savings of just £100 or less, the decision by a credit union to harness the power of music to encourage young people to become more money wise, and less susceptible to the temptations to spend money on things they don't need is a timely one. PCU-Money, the Shadow Youth Board of the Pentecostal Credit Union, one of the UK's largest credit unions, released music video Gimme Dat today (7 October 2016). The song, Gimme Dat by PCU-Money ft Tneek seeks to highlight the materialism and enticement to spend money promoted by our consumer society, and tell young people that they need to be more money-wise and save instead of spend. Tneek is an up and coming female rapper who's performed alongside artists such as Wretch 32, Chip and Artcha. She said, "It was great to work on this project and let young people know it's a good thing to be money wise. There's so much temptation for young people to spend – whether it's to copy the lifestyles of celebrities like Kim Khardashian or to buy things that they don't need to live up to a fashionable image. Gimme Dat, brings these issues to the fore and calls on young people to give careful consideration to how they spend their cash." 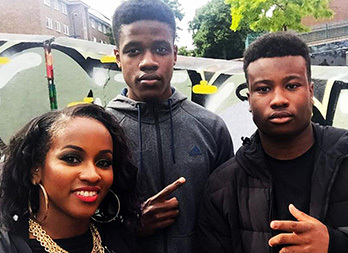 The Gimme Dat video was filmed on the streets of Balham and Brixton and features Tneek and the members of the Youth Shadow Board who are aged between 11-18 years. The Youth Shadow Board hope that Gimme Dat starts a conversation amongst young people about money matters and help them become more money wise. Shane Bowes, CEO of the PCU stated "We don't want young people to fall into the trap of not being financially aware, especially following the BBC report stating that millions of adults have little or no savings. “We have to help our youth plan for their financial future, that's why PCU have supported our Youth Shadow Board's Gimme Dat initiative. "They are using music to send a much needed message that its important for young people to increase their financial awareness, become money wise and save their money for their future." The release of Gimme Dat will be accompanied by money talks at youth gatherings in London and the Midlands.